The FirstScope is a wonderful keepsake for anyone interested in astronomy. 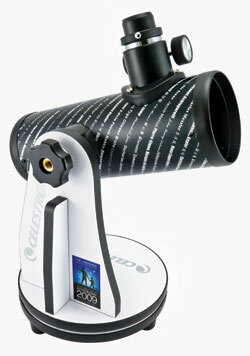 This quality Dobsonian style telescope features a 76 mm aperture reflector optical tube. FirstScope is an ideal entry level astronomical telescope. It is very easy to observe with, the user simply navigates the night sky by moving the tube in the direction of their desired object, making the viewing experience a snap! The compact design makes it easy enough to take with you on your next outdoor adventure. The FirstScope is also stylish enough to be a decorative fixture on your bookshelf or desk.